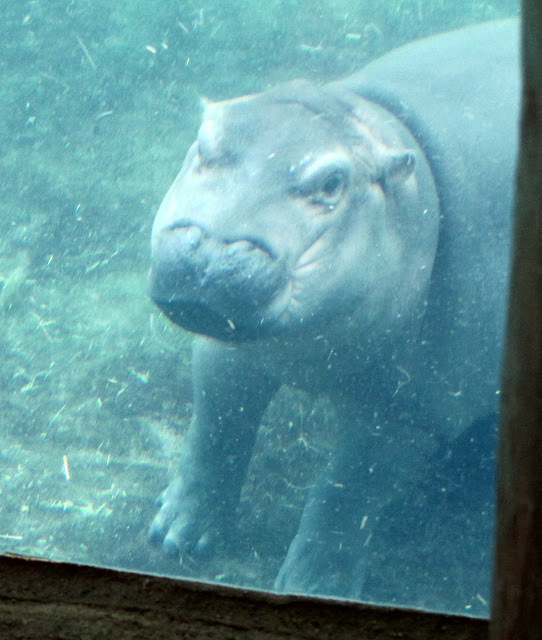 A story, not about polar bears, but about our local little star Fiona, the miracle baby hippo. 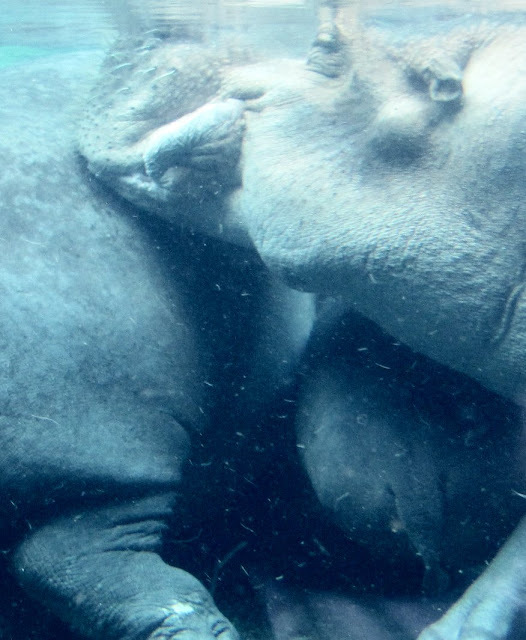 January 24, and it was a cold winter morning at the Cincinnati Zoo when 17 year old Bibi the Nile Hippo gave birth to her first baby, so premature that the wee little one was not expected to survive. This baby girl only weighed 29 pounds, and a normal newborn hippo weighs 55 pounds at minimum, but this little one arrived six weeks early. A baby hippo born this small had never survived. She was so small and weak that she couldn't stand up to nurse. The hippo habitat was turned into a preemie nursery. 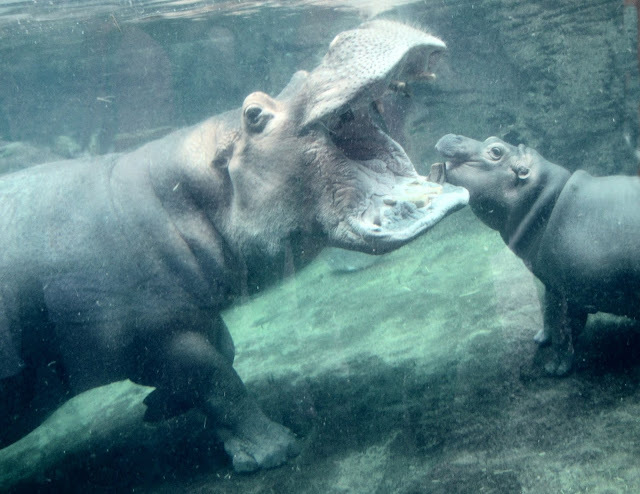 A regimen of 24 hour care, bottle feedings, and research in to how to raise a premature baby hippo kept the caregivers busy as they gave this little girl a name, Fiona, and some revolutionary treatments to keep her going. Mother Bibi was patient as the staff milked her so the valuable early milk and colostrum could help build up Fiona's defenses. 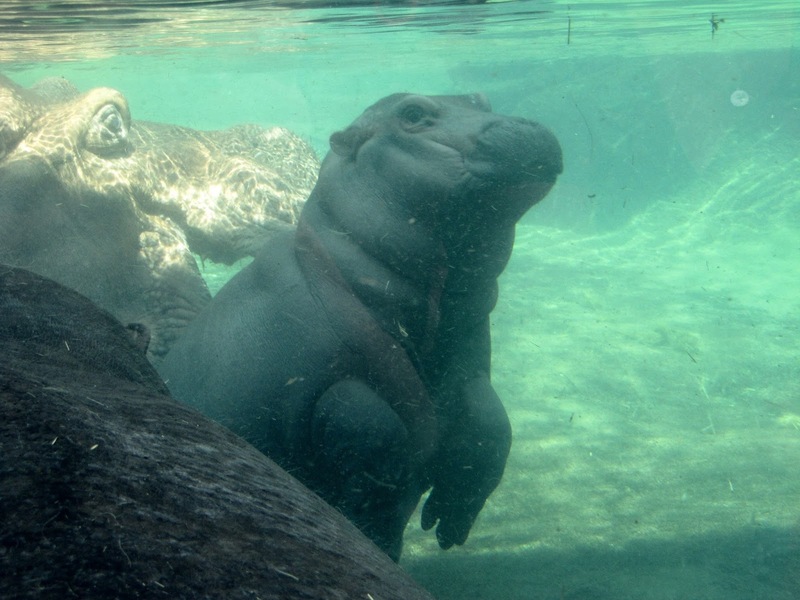 Fiona was given pool time early on as a way to exercise her muscles and build up her strength. As she got bigger, the zoo brought in bigger baby pools and lots of pool toys. Medical professionals from Children's Hospital came to the zoo to help in setting up how to administer supplemental oxygen, for Fiona's preemie lungs were still underdeveloped. The caregivers also gave her fluids through IV feedings in addition to her bottles, to help Fiona over a difficult patch in early February. Fiona was a fighter, but those early weeks were touch and go at times. 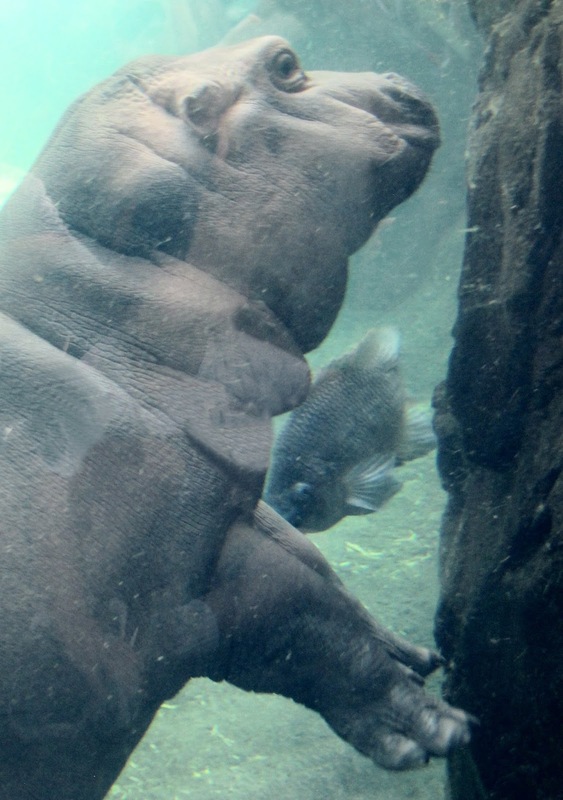 The keepers kept Fiona near her mother and father 35 year old Henry so they could see, hear and smell each other. The staff hoped one day to reunite the family, but had no idea just how this would work. 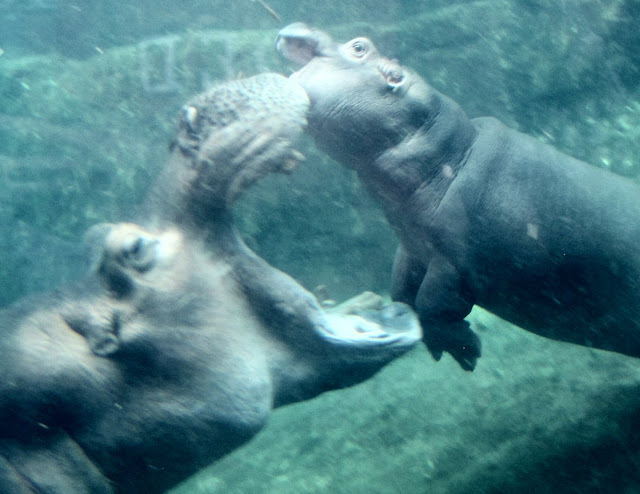 Would the adult hippos realize this was their baby? Would Fiona even survive? 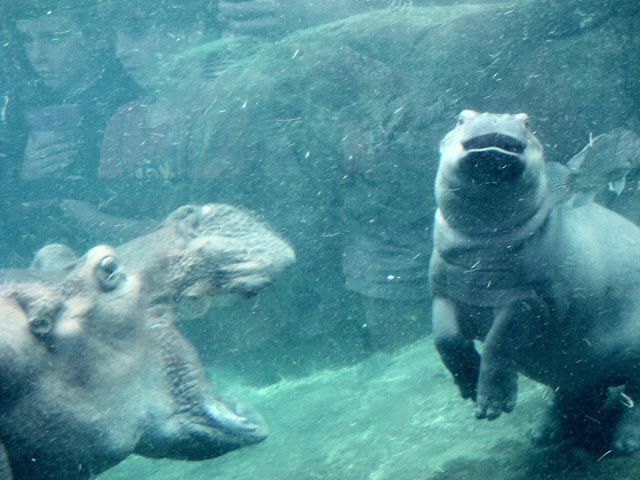 All the while, Fiona's fame was growing. 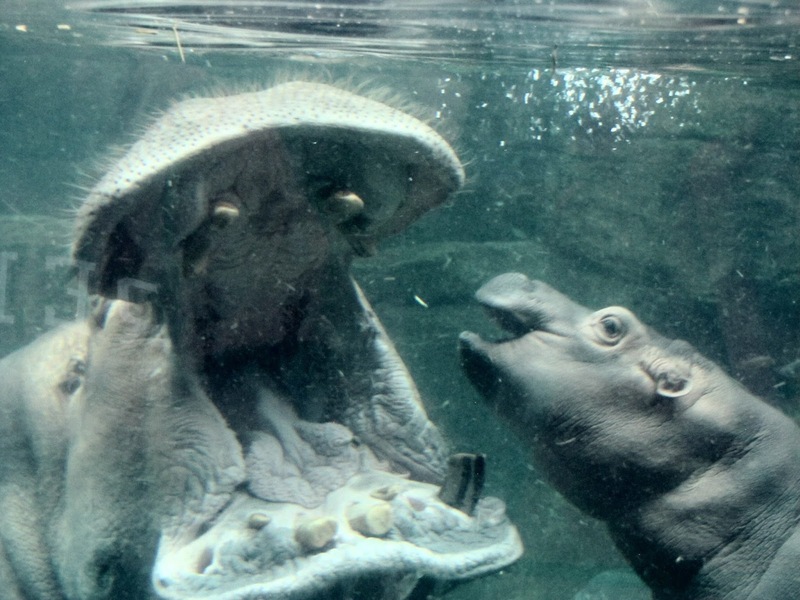 There were daily updates on the zoo's facebook page. 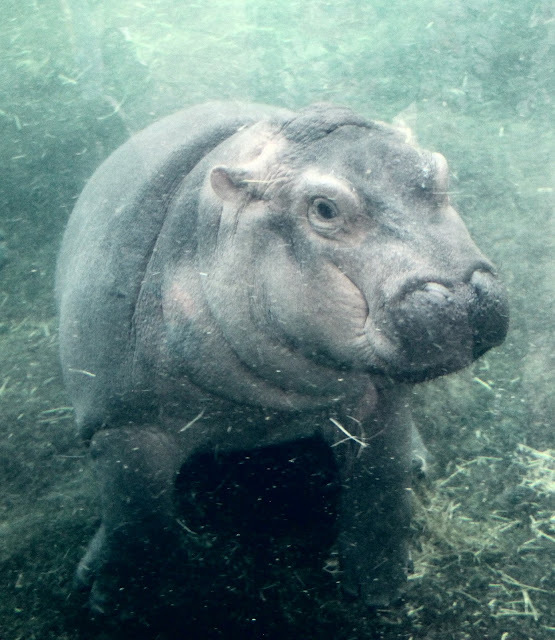 Local and national TV stations featured Fiona videos. There were Fiona cupcakes as a fundraiser, and T-shirts and Fiona beer. 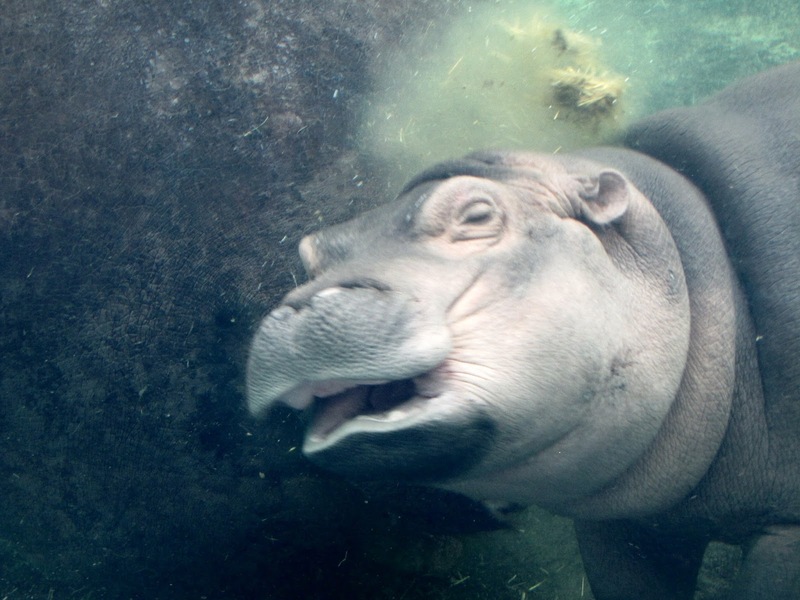 Fans from all over the world were following Fiona's journey as she struggle to survive and to thrive. 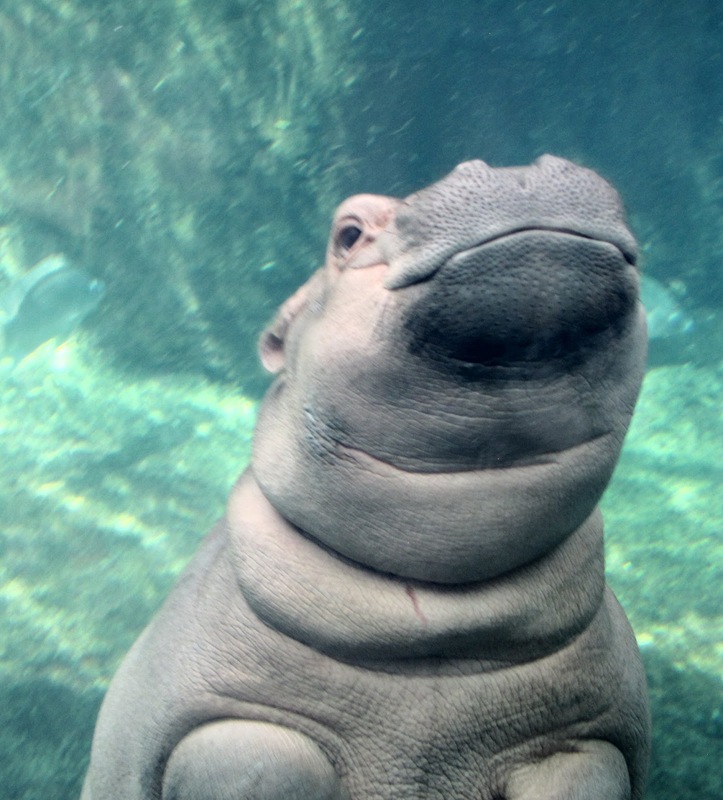 Fiona news was a welcome counterbalance to all the bad news in the world. Fiona was seem as welcome ray of sunshine in a gloomy world. 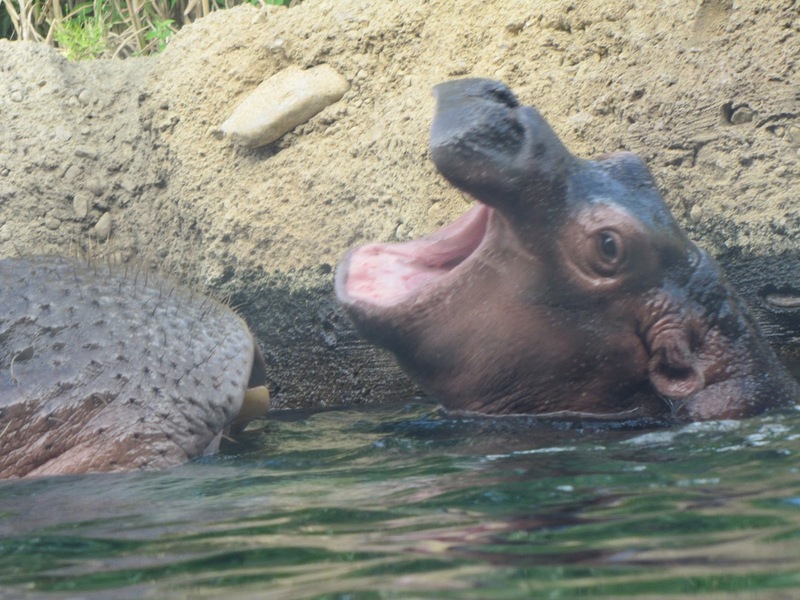 Facebook photos and videos showed the milestones in Fiona's young life, and also the fun moments when she played in cardboard boxes, or fell asleep in the shower. As Fiona got bigger, she was able to graduate to the large inside pool, with higher and higher water levels. When she was large enough and had gained the skills she needed, in early June, she was introduced to the outside pool, with the help of her keepers dressed in diving outfits to assist the little hippo in adjusting to the new experience. 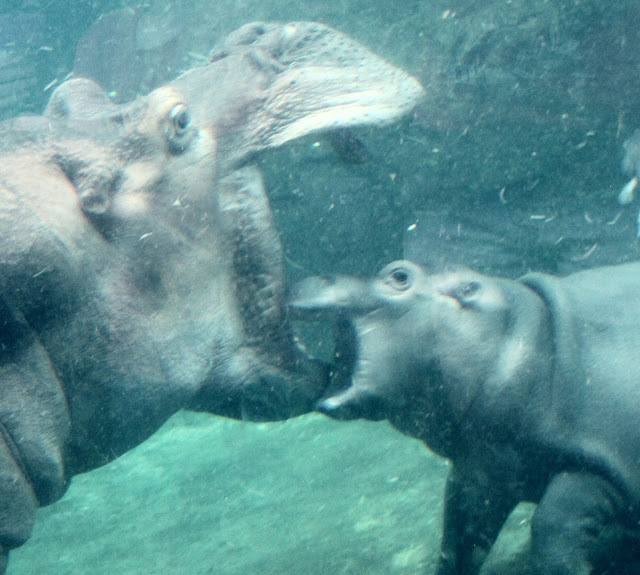 Fiona started spending some time with her mother, first through a grid, then face to face. 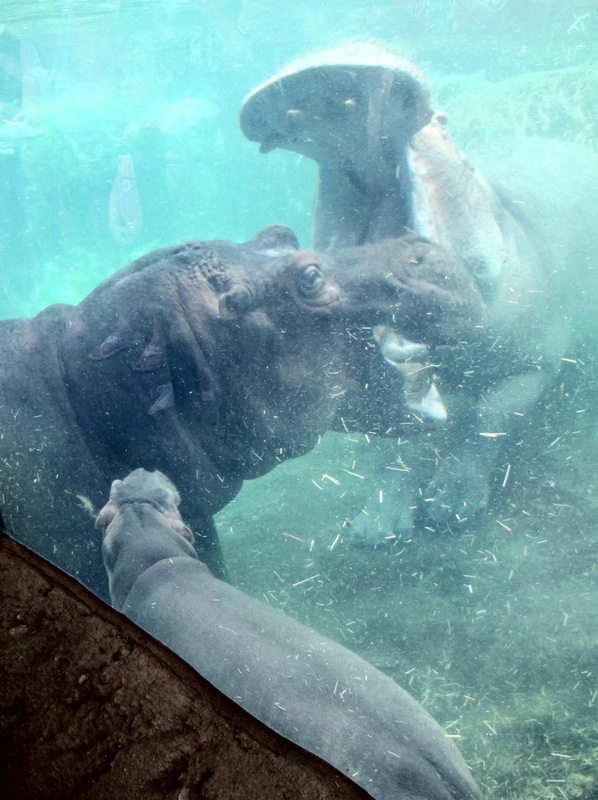 She gradually worked up to some pool time with mom in mid June, during times the zoo was closed. This week, mid July, she met her father Henry face to face in the pool, and on Thursday, napped in the pool between her parents. 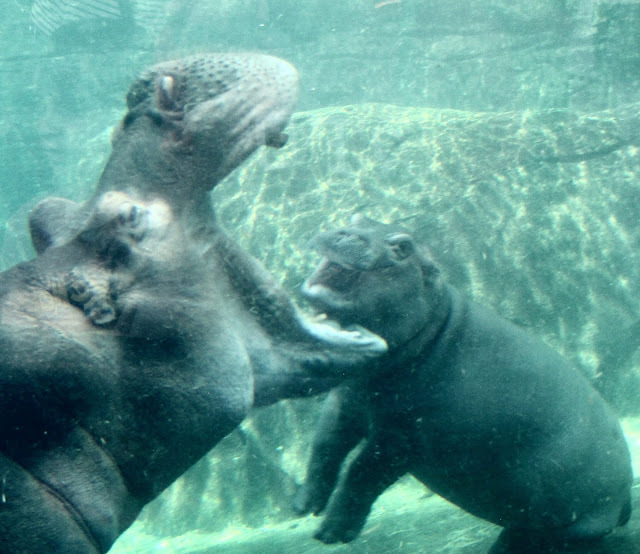 Bibi was protective of Fiona on Thursday, nipping at Henry if he got too close. All of the photos of Fiona here were taken on Friday, July 14.
and keep the pool clean by eating all the hippo poop. 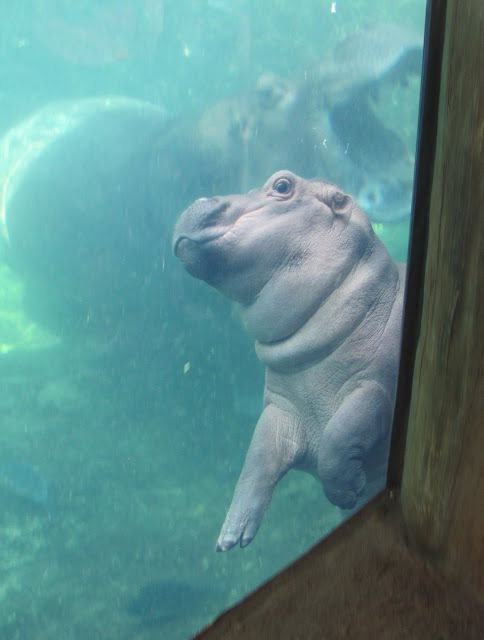 For the past few weeks, Fiona has been slowly introduced to the public, for only a short time on certain days, unannounced. This week, some have been lucky enough to catch a glimpse. 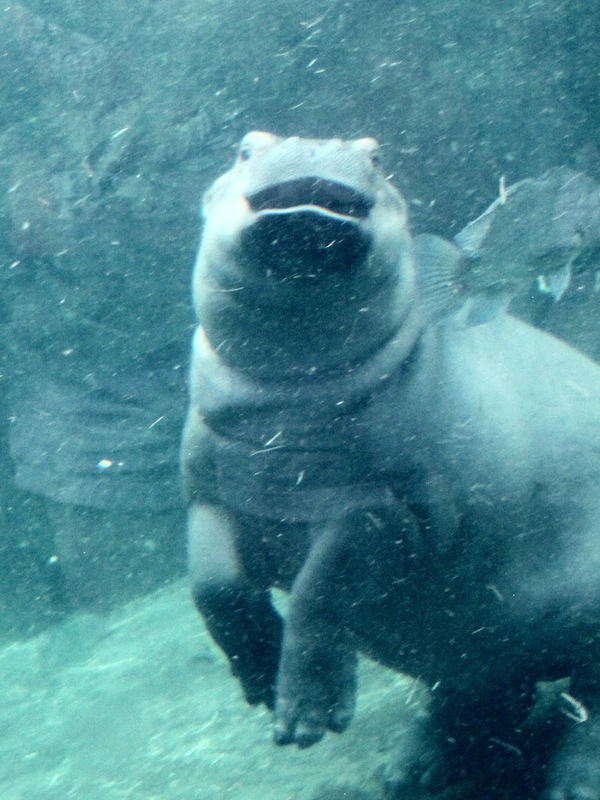 I made a quick trip to the zoo on Friday afternoon, in hopes of seeing the elusive Fiona. And there she was, napping between mom and dad in the pool, just her little bottom showing. I waited and waited. One lady remarked that she came all the way from Virginia just to see Fiona, and she was so glad that Fiona was out in the pool. Eventually, Henry woke up and got out of the way, and we could all see Fiona. 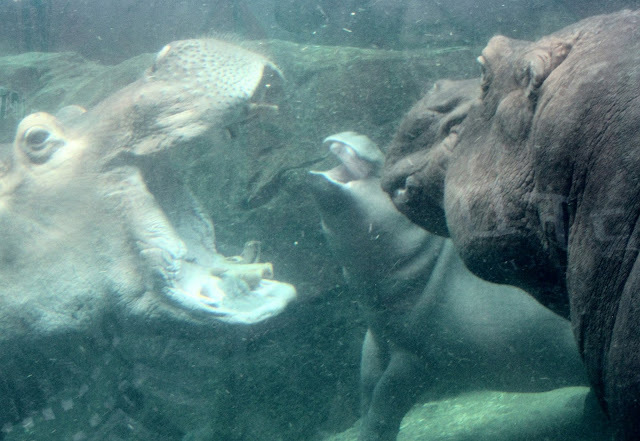 Soon all three hippos were moving about, and Fiona was gracefully bobbing up and down. 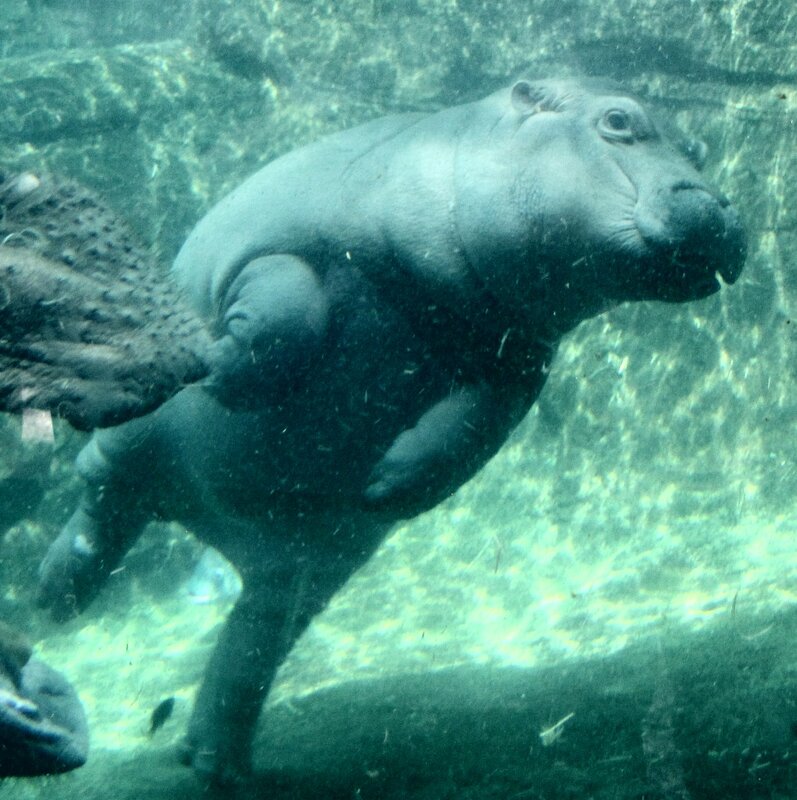 Fiona above water. She can hold her breath for 3 minutes now. Adults can stay under for up to 5 minutes. And then she and Daddy Henry decided to get to know on another. 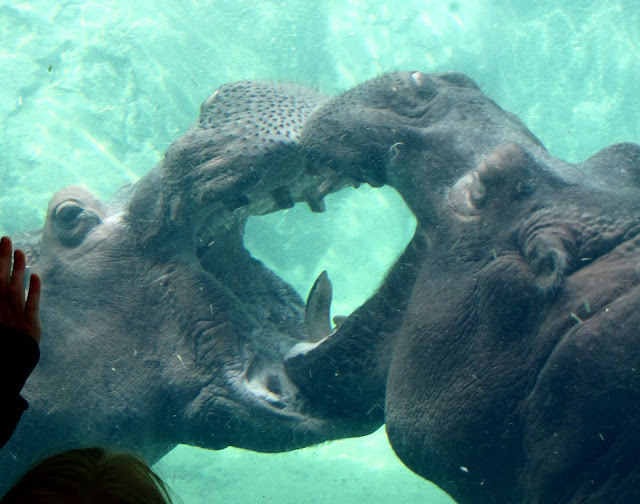 Hippos use their mouths to investigate the world and communicate with other hippos, so Henry opened his mouth wide and Fiona went right in. This video of of their first such encounter. 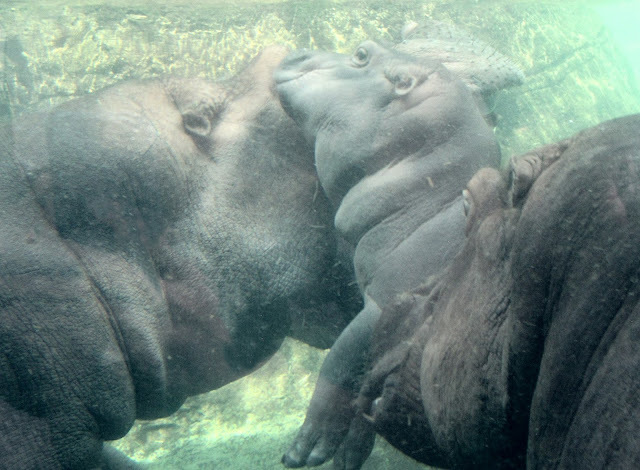 I know Fiona climbed into her mother's mouth when they first met face to face. 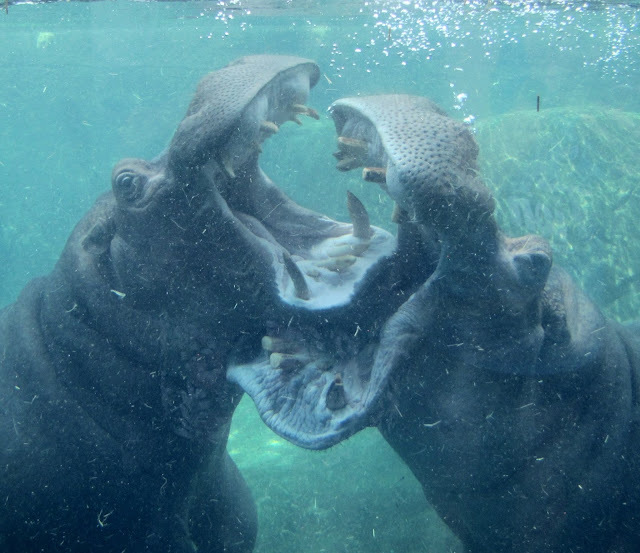 It is natural hippo behavior to mouth each other. Henry was very patient and gentle with Fiona, letting her take her time in getting to know him. He held his mouth open and let her inspect as long as she wanted, sometimes below water, and sometimes above. 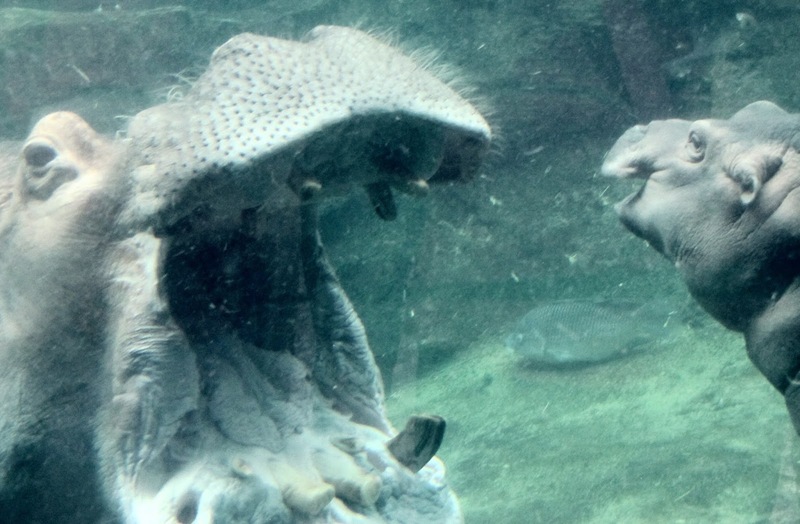 It looked scary to the visitors, to have this little baby inside of the huge hippo's mouth, but it is perfectly natural for a hippo. 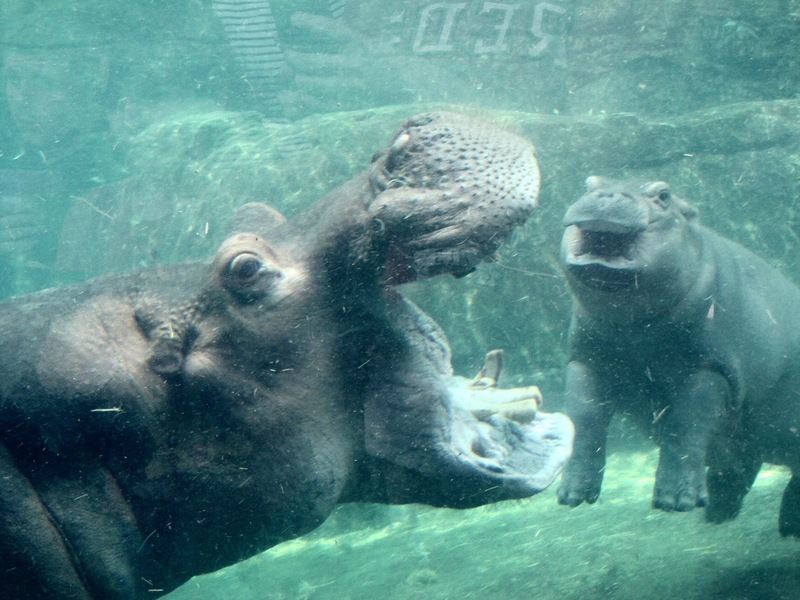 Henry and Bibi may or may not realize that this is their baby, but the treat Fiona as any hippo in a "bloat" would treat a baby hippo, with care. 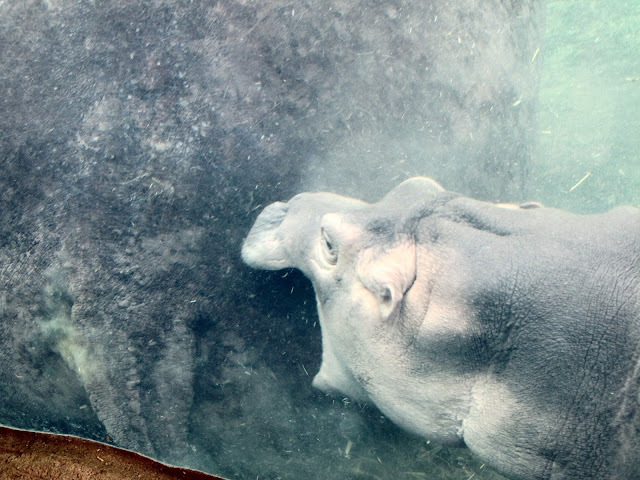 Hippos poop a lot, and here Fiona is right up close to her mother when it happens! The fish are there to eat it, and keep the pool clean. 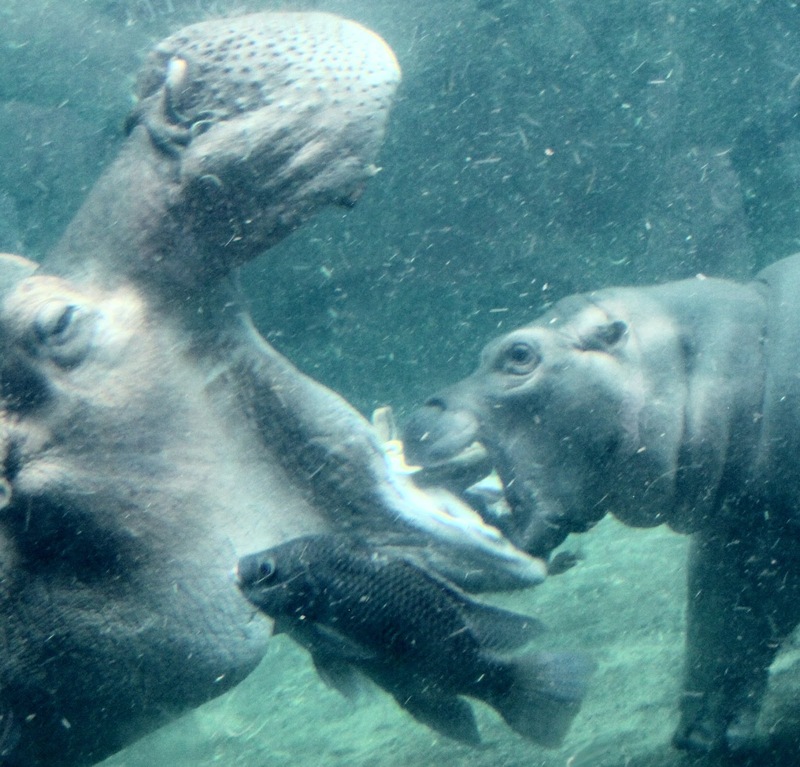 These hippos eat 25 to 30 pounds of hay, lettuce and other vegetable matter per day. 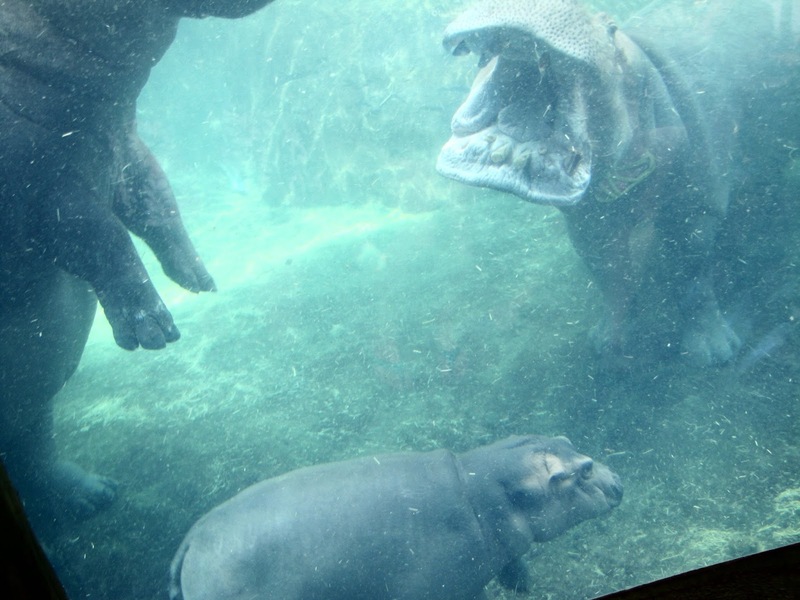 Hippo Cove also has a state of the art water filtration system. 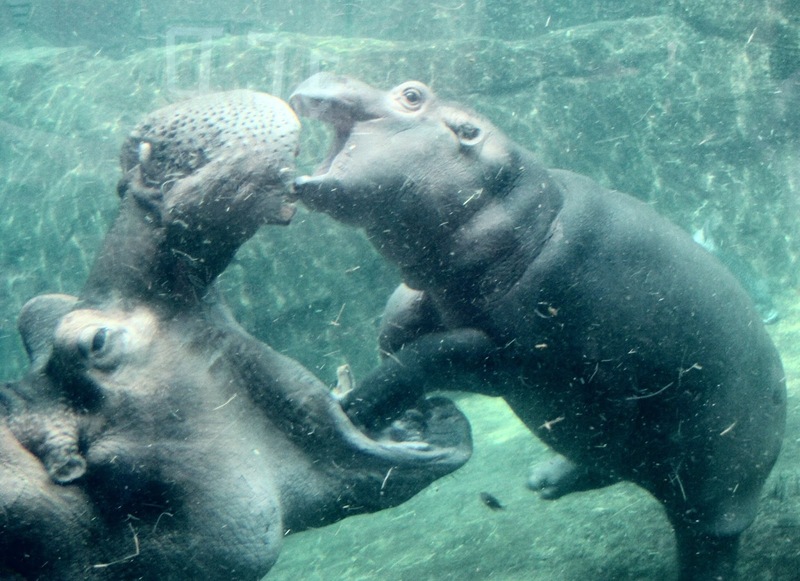 Fiona bites her mother's behind, playfully, right after the poop incident. There were times when they paid attention to the young hippo, but then they forgot about her and just noticed each other. 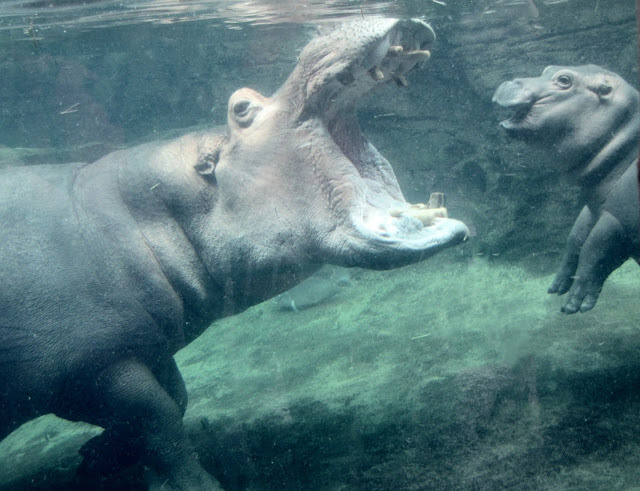 Henry has always been crazy in love with Bibi since they first met a year ago when Hippo Cove first opened at the Cincinnati Zoo. The gestation period is 8 months, and Fiona's due date was in March. 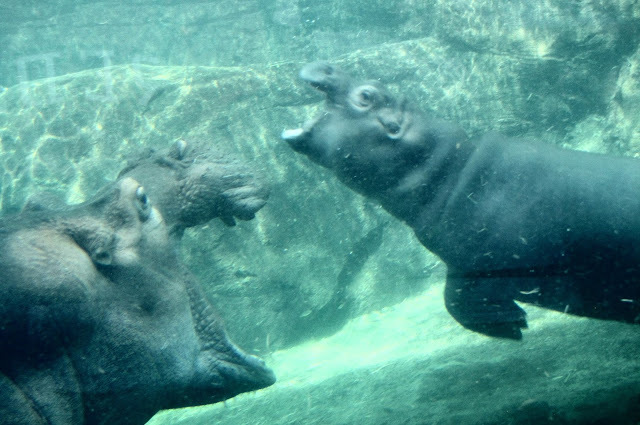 When the adults are otherwise busy, Fiona wanders off and plays on her own, sometimes going into the shallow dip of a pool in the rear of the big pool. Mom and Day, I am here! 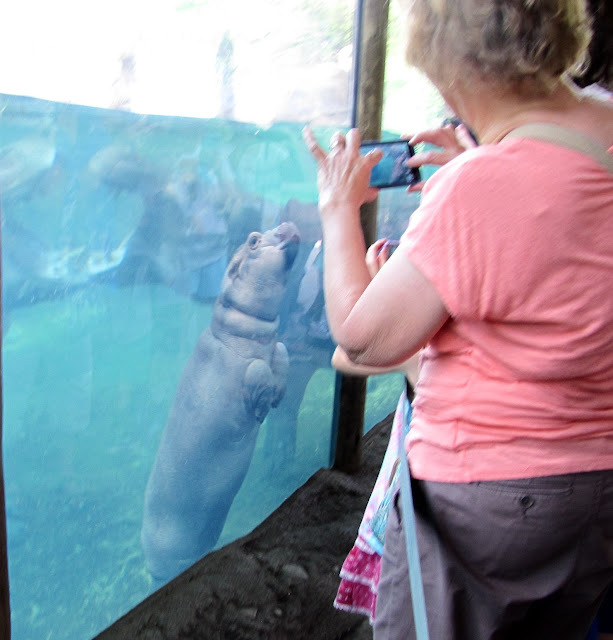 She seems aware of the visitors too, and swims back and forth, up and down, in front of the glass, much to the delight of her fans. After all, she was raised by humans, and loves attention from everybody. 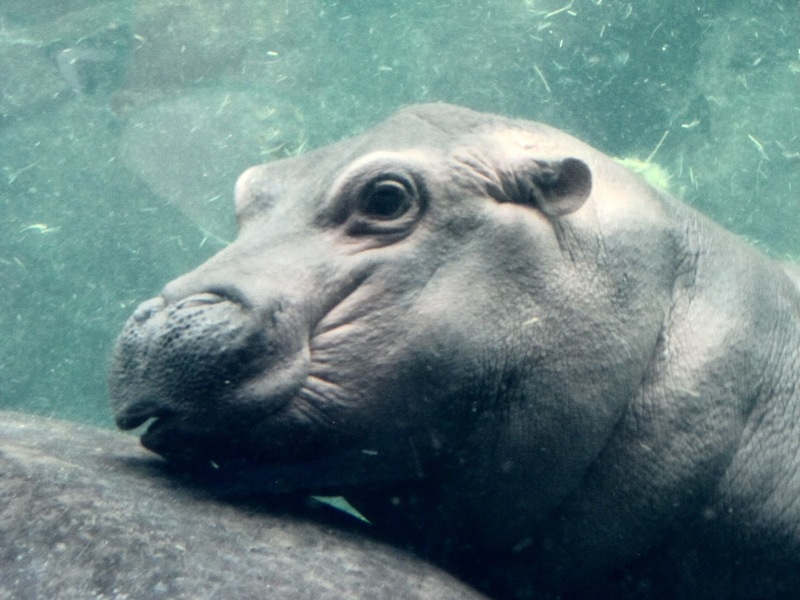 Now that the family is reunited, and everything is going well, I suspect that Fiona will be on exhibit most of the time, although it is always her prerogative to stay inside if she prefers. She has come a long ways in less than 6 months. She now weighs 375 pounds, and that number goes up every day. 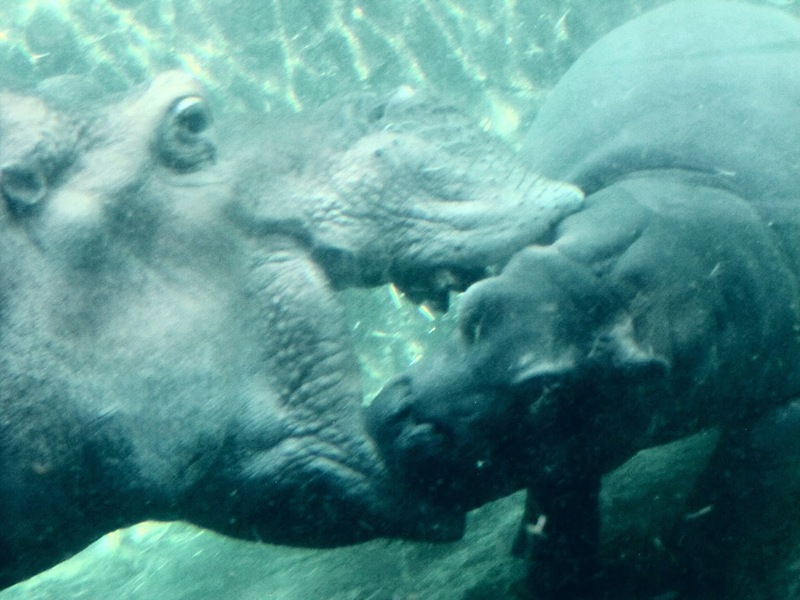 Her mother Bibi is said to be 3000 pounds, and father Henry is 4000 pounds. 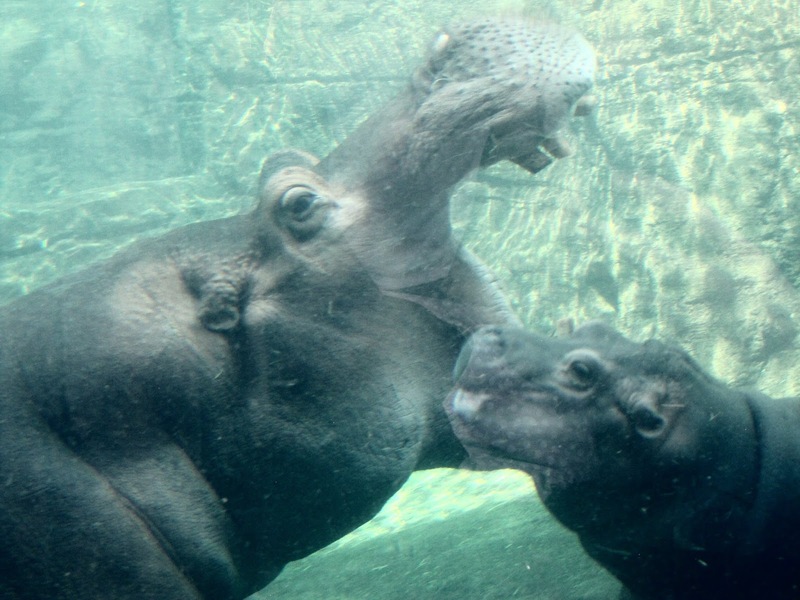 Fiona has inherited Henry's coloring, with pink markings on the sides of her face. 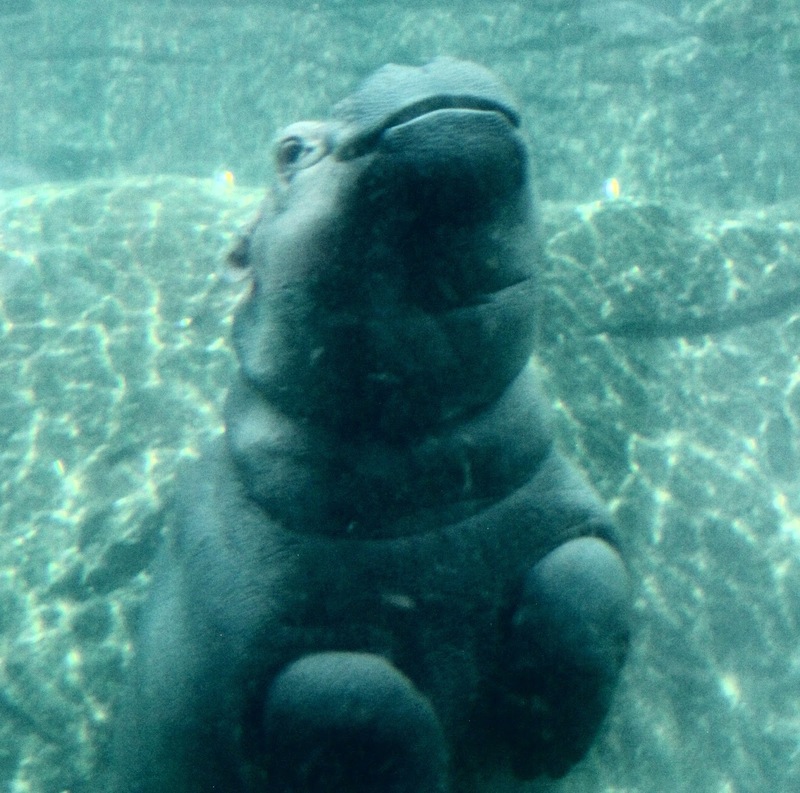 July and August will be very busy at Hippo Cove, now that Fiona has made her debut. She is truly a worldwide sensation! There are rumors about books, movies and more, starring Fiona! Fiona is such a cutie!Thank you so much for this interesting report and the adorable pics!